Lexington, Ky. – The United States Equestrian Federation (USEF) is pleased to announce its continued collaboration with Kentucky Equine Research (KER) as the Official Equine Nutritionist of the USEF. Since 2000, KER has been a valuable partner to the USEF in coordinating the nutritional program for high-performance horses as they travel to international competitions, including five Olympic Games and four FEI World Equestrian Games. The personnel at KER realize the importance of quality and consistency in the feed and management of these top competitors. The logistical task of delivering feed to international competition sites is complex. KER assesses the location and environment of each competition venue before recommending diets suitable for U.S. horses. The experts at KER then manage the export shipping logistics in order to ensure that feed as well as forage, supplements, and bedding arrive at the appointed destination ahead of the horses. While on site at international competitions, KER personnel provide support services for the duration of the event. As U.S. equestrian athletes prepare for the 2016 Olympic Games, the USEF recognizes the critical role of KER as the official nutrition consultant for the Olympic Games. In this capacity, KER collaborates with Olympic Games organizers and National Federations to procure the best feeds, forages, and beddings. The USEF is working closely with KER in preparation for Rio de Janeiro, according to Connell, and will also rely on the company’s advice and support in Lima in 2019 and Tokyo in 2020. “Nutrition is a cornerstone of performance, and KER has the expertise to support our programs and our riders,” Connell commented. Ocala, FL (March 13, 2013) – Known for his support and dedication to equestrian sport across the world, Chester Weber will once again share his knowledge and experience in the world of horses with attendees of the 25th Anniversary Sport Horse Forum, presented by Kentucky Equine Research (KER). The topic of the forum is Advances in Equine Nutrition and Health, and Weber will join an international panel of experts, champion equestrians, and Olympians as they celebrate KER’s 25 years of research and innovation into equine nutrition and examine the evolution of horse sport. The event will take place on March 20, 2013 at 6pm at Live Oak Plantation. The Forum will feature speakers Joe D. Pagan, Ph.D., founder of Kentucky Equine Research, presenting the topic The Evolution of Sport Horse Feeding: Much More Than Hay, Oats, and Water, and Brendan Furlong, M.V.B, M.R.C.V.S, long time veterinarian for the United States Eventing Team, presenting the topic Significant Changes in Equine Veterinary Practices during the Last Quarter Century. These dissertations will be followed by a Round Table discussion entitled Top Competitors Discuss How Their Disciplines Have Changed over the Years, featuring panelists John Crandell, international endurance rider; David O’Connor, Olympic Gold medalist and chef d’equipe of the United States Eventing Team; Chester Weber, nine-time United States Equestrian Federation Four-in-Hand Driving National Champion and Individual Silver Medalist at the 2012 World Driving Championships; and moderator Samantha Clark. Weber is known for his dedication to the equestrian industry and international sport, and has served on many advisory boards and committees. His resume is lengthy, and in 2011 he was named an Equestrian of Honor by the USEF and was also the recipient of the Becky Grand Hart Trophy. He was named the 2011 Driving Horseman of the Year in The Chronicle of the Horse Magazine’s annual American Horses in Sport issue. Weber served as Chef d’Equipe to the United States Pony and Pony Pairs teams at the 2011 World Pony Driving Championships, and has served on the USEF Board of Directors, the High Performance Driving Committee and the Driving Safety Committee. He also served as Chairman for the Active Athlete’s Committee and the Dressage Search Committee. Weber also currently serves on the Board of Directors for the Florida Horse Park Foundation. For more information on Weber and his combined driving team, visit their website at www.chesterweber.com. Register for the forum by visiting www.sporthorseforum.eventbrite.com, and for more information on the forum call 859 873 5663 or email ephetbean@ker.com. Lifelong horse enthusiast Sherri Heichelbech, Fort Branch, Ind., won a free training session with three-time national combined driving champion Shelly Temple in a recent contest sponsored by Kentucky Equine Research (KER). “I am so excited! 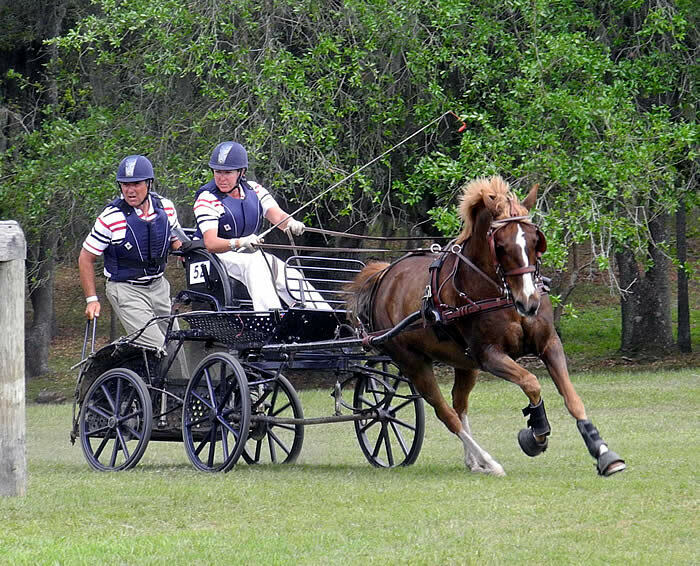 I signed up for the contest because I am eager to learn more about combined driving, and Shelly Temple has such a great reputation,” said Heichelbech, who has been pleasure driving for several years but plans to compete in a combined driving event for the first time this summer. Several equine neurologic diseases, such as neuroaxonal dystrophy, equine degenerative myelopathy, and equine motor neuron disease, have been shown to be caused by vitamin E deficiency or to improve with vitamin E supplementation. Many veterinarians prescribe vitamin E supplementation for the treatment of equine neurologic diseases because of its neuroprotective effects. The usual recommended dose of micellized natural vitamin E (water-soluble d-α-tocopherol) for horses with neurologic disease is 5,000-10,000 IU by mouth every 24 hours. This is approximately 10-20 times the dietary requirement for a 1,100-pound (500-kg) horse. Reprinted with permission of the copyright holder, Kentucky Equine Research; for more free equine nutrition information, visit www.Equinews.com.